These two ensembles share the talents of horn section members Rick Faulkner (trombone) and Debra Kreisberg (clarinet/alto sax), while LMV bassist Anna Milat-Meyer also performs with Isle of Klezbos klezmer sextet. At this year's show, both bands will also share versions of a new original piece by LMV leader Jessica Valiente. 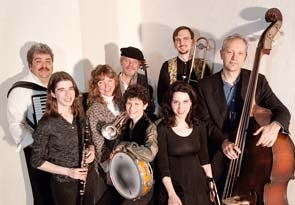 Metropolitan Klezmer features a wide-ranging, mood-changing mix, including adaptations of vintage soundtracks from the Yiddish Celluloid Closet project, while Los Mas Valientes performs repertoire from their newly-released third CD, "Titere Fue". Gorgeous arrangements and glorious grooves guaranteed!